What are the types of dental implants? Why are they used? How much does a dental implant cost? Does insurance pay for dental implants? Dr. Donna S. Bautista, DDS, completed her undergraduate studies at the University of California, San Diego with a bachelor of arts in biochemistry and cell biology. During her time at UC San Diego, she was involved in basic research including studying processes related to DNA transcription in the field of molecular biology. Upon graduation, she went on to attend dental school at the University of California, San Francisco. In addition to her formal dental training, she provided dental care for underserved communities in the Bay Area through clinics and health fairs. She also worked toward mentoring high school students interested in the field of dentistry. Dental implants as we know them today were invented in 1952 by a Swedish orthopedic surgeon named Per-Ingvar Brånemark. Today, they are considered the standard of care for prosthetic replacement of missing teeth in dentistry. A dental implant is a surgical fixture that is placed into the jawbone and allowed to fuse with the bone over the span of a few months. The dental implant acts as a replacement for the root of a missing tooth. In turn, this "artificial tooth root" serves to hold a replacement tooth or bridge. Having a dental implant fused to the jawbone is the closest thing to mimicking a natural tooth because it stands on its own without affecting the nearby teeth and has great stability. The process of fusion between the dental implant and jawbone is called "osseointegration." Most dental implants are made of titanium, which allows them to integrate with bone without being recognized as a foreign object in our body. Over time, technology and science have progressed to greatly improve the outcomes of dental implant placement. Today, the success rate for dental implants is close to 98%. A dental surgeon examines the area to be considered for the dental implant and makes a clinical assessment of whether the patient is a good candidate for a dental implant. There are great advantages to choosing a dental implant for tooth replacement over the other options. Dental implants are conservative in that missing teeth can be replaced without affecting or altering the adjacent teeth. Furthermore, because dental implants integrate into the bone structure, they are very stable and can have the look and feel of one's own natural teeth. Historically, there have been two different types of dental implants: (1) endosteal and (2) subperiosteal. Endosteal refers to an implant that is "in the bone," and subperiosteal refers to an implant that rests on top of the jawbone under the gum tissue. Subperiosteal implants are no longer in use today because of their poor long-term results in comparison to endosteal dental implants. While the primary function of dental implants is for teeth replacement, there are areas in which implants can assist in other dental procedures. Due to their stability, dental implants can be used to support a removable denture and provide a more secure and comfortable fit. In addition, for orthodontics procedures, dental mini-implants can act as temporary anchorage devices (TAD) to help move teeth to a desired position. These mini-implants are small and temporarily fixed to bone while assisting in anchorage for teeth movement. They are subsequently removed after their function has been served. For patients who have lost all their teeth due to decay or gum disease of the upper and/or lower arch, an option is available to provide a very stable and comfortable prosthesis using a minimal number of implants. One such is example is the "All-On-4" technique that was named by implant manufacturer Nobel Biocare. This technique gets its name from the idea that four implants can be used to replace all teeth in a single arch (upper or lower). The implants are strategically placed in areas of good strong bone, and a thin denture prosthesis is screwed into place. The All-On-4 technique provides teeth replacement that is stable (not removable) and feels like natural teeth compared to the older method of traditional (removable) complete dentures. Without a doubt, implant dentistry has allowed for more treatment options to replace single and multiple missing teeth with long-term stability and contributes to improved oral health. During the consult and planning stage, the dental surgeon will visually examine the site in the mouth where a dental implant is being considered as well as look at dental imaging studies (X-rays, panoramic films, and/or CT scans). At this time, the quality and quantity of jawbone is assessed to determine if more bone is needed at the site. Once it has been established that a dental implant can be placed in the desired location, the patient will return for surgical procedures for the dental implant(s). During all surgical procedure appointments, the patient is usually given local anesthetic to numb the surgical area as well as any other sedatives necessary for comfort and anxiety. The first stage of oral surgery often involves a tooth or teeth extraction. Oftentimes, the site of a dental implant still has an existing damaged tooth present. In order to prepare for placement of a dental implant, the tooth will need to be extracted. More often than not, an "alveolar bone graft" (cadaver or synthetic bone) is placed to achieve a solid base of bone for the implant. This site will be allowed to heal for two to six months. For a site that has no tooth and bone loss is present, it will require a different bone graft that is placed on top of existing jawbone ("onlay bone graft"). This procedure is more involved and usually requires about six or more months of healing. In some instances, when enough bone is present, the damaged tooth can be extracted followed by the implant placement procedure at the same appointment. This procedure is called "immediate implant" placement. In the situation where an implant is to be placed in the maxilla (upper jaw) in the back or posterior region, sometimes the available amount of bone may be limited by the presence of the maxillary sinus (air-filled space found in the bones of the face). "Sinus augmentation" or "sinus lift" is performed to raise the sinus floor and graft more bone into the sinus. This will make more bone available to support a dental implant. Once adequate, strong bone is present, the site is ready for the implant. At the implant placement appointment, the dental implant (titanium post) is placed into the bone with a special drill and tools. A "healing cap" is placed over the implant, the gum is stitched up, and the healing phase begins. During this healing phase, a temporary denture can be made to replace missing teeth for esthetic purposes. Healing time depends greatly on the quality of bone present. Healing time is usually anywhere from two to six months. During this time, the implant becomes integrated with the bone. It's important to avoid placing any force or stress on the dental implant as it heals. Follow-up appointments to check the surgical site are typically done to ensure that no infection exists and healing is taking place. After the required healing period, the dental implant is tested to determine whether it was successfully taken up by the surrounding bone. Once this has been confirmed, a prosthetic component is connected to the dental implant via a screw. This component is called an "abutment." It will serve to hold the replacement tooth or "crown." The dentist will take an impression (mold) of this abutment in the mouth and have the implant crown custom-made to fit. The implant crown is either cemented on or secured with a screw to the abutment. The cost of a single dental implant can vary depending on the region and who is performing the procedure. A conservative cost estimate for a single dental implant is $3,000-$4,500. This cost includes the surgery for placement of an implant, all the components, and the implant crown. Dental insurance typically does not pay for dental implant placement. Some dental insurances may help pay for the implant crown portion. Unfortunately, in many cases, dental insurance considers dental implants to be an elective procedure even though dental implants have become the standard of care for replacement of missing teeth. Dental implants have become a favored option for tooth replacement because they offer a conservative approach and provide predictable results with success rates close to 98%. With any surgery, there are always some risks and potential complications to the patient or to the success of a dental implant. Careful planning is important to ensure that a patient is healthy enough to undergo oral surgery and heal properly. Just like any oral surgery procedure, bleeding disorders, infections, allergies, existing medical conditions, and medications need careful review prior to proceeding with treatment. Fortunately, the success rate is quite high and failures usually occur in the unlikely event of infection, fracture of the dental implant, overloading of the dental implant, damage to the surrounding area (nerves, blood vessels, teeth), poor positioning of the dental implant, or poor bone quantity or quality. Again, careful planning with a qualified surgeon can help avoid these problems. In many cases, another attempt can be made to replace a failed dental implant after the requisite time for healing has taken place. Dental implant surgery is usually performed under local anesthetic, and therefore, no pain should be felt during the procedure. After the local anesthetic has worn off, the post-surgery discomfort will vary with each individual case. However, in general, most people will feel discomfort similar to a tooth extraction afterward. A cold ice pack is placed on skin over the area of surgery immediately after treatment to help reduce swelling. This pain typically can be managed with over-the-counter pain medications such as ibuprofen (Advil) or acetaminophen (Tylenol). More invasive surgery may require a stronger prescription pain medication and more recovery time. Aside from pain medications, prescriptions for antibiotics and oral rinses may be needed to support healing of the area for the following few weeks. Dental implants have the risk of developing a condition called "peri-implantitis," which is the equivalent of periodontal (gum) disease for natural teeth. This refers to inflammation of the gum and bone surrounding the implant. The inflammation of the surrounding tissues is often due to excessive biting forces on the implant or bacterial infection. Peri-implantitis can result in the loss of an implant if left untreated. After getting a dental implant, routine maintenance care at home and follow-up at the dental office are essential in avoiding this condition. Good oral hygiene for a dental implant at home involves routine brushing and flossing to keep food debris and plaque away. In the dental office, the surrounding soft and hard tissues are examined and special tools are used to remove harder calcified deposits around the dental implant. If needed, the bite is adjusted to ensure that the implant does not sustain heavy biting forces. Implant surgery can be performed by any licensed dentist provided that the treatment follows the standard of care and is in the best interest of the patient. However, since implants are surgically placed in the jawbone, dental specialists who routinely perform surgery within the jawbone are the natural fit for implant surgery. Oral maxillofacial surgeons (oral surgeons) treat all hard and soft-tissue diseases or defects, which includes extraction of teeth and jaw surgeries. Periodontists treat disease of the surrounding structures of teeth such as the gum and jawbone. Both oral surgeons and periodontists often specialize in dental implant placement. Once the implant has integrated fully into the jawbone, the next phase involves placement of the implant crown that will be supported by the implant. This is typically performed by the general dentist or a prosthodontist (dental specialist focused on tooth replacement). Singh, K. et al. "Temporary Anchorage Devices -- Mini-implants." National Journal of Maxillofacial Surgery 1.1 (2010): 30-34. Weinstein, R. et al. "Immediate Rehabilitation of the Extremely Atrophic Mandible with Fixed Full-Prosthesis Supported by Four Implants." Clinical Implant Dentist and Related Research 14.3 (2012): 434-41. Get the facts on oral hygiene and causes, symptoms, treatments, and prevention of periodontal diseases, tooth decay, cavities and cancer of the mouth. How much did your dental implant cost? Did insurance help to cover the cost? Please describe your dental implant procedure. Have you experienced dental implant failure? Did you feel a lot of pain when you got a dental implant? Facial implants may be used to enhance the appearance of the cheeks, jaw, or chin. Facial implants are inserted during surgery. Either local anesthesia with an oral sedative or general anesthesia may be used. Side effects of surgery may include fever, pain, swelling, or abnormal discharge from the incision site. A dry socket is a potential complication that can occur when a blood clot in the gums becomes dislodged after a tooth extraction. Dry socket signs and symptoms include pain, mouth odor, and unpleasant taste in the mouth. A dentist may treat a dry socket with analgesic dressing. Over-the-counter pain medications can also relieve symptoms. A dry socket usually heals within 7 days. Avoiding smoking, drinking with a straw, and vigorous rinsing and spitting may help prevent the formation of dry socket. 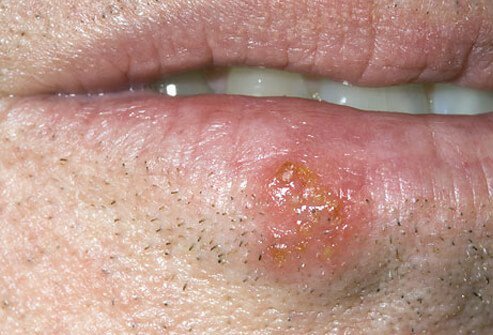 The term oral cancer includes cancer of the mouth (oral cavity) and the back of the mouth (oropharynx). Red and white patches inside the mouth, bleeding, loose teeth, pain upon swallowing, a lump in the neck, earache, and a sore on your lip or in your mouth that won't heal are all symptoms of oral cancer. Treatment for oral cancer depends upon the staging of the disease and usually involves surgery, radiation therapy, or chemotherapy. Oral surgery is a procedure that may be used to remove wisdom teeth, insert dental implants, correct and repair jaw deformities, treat TMJ, cleft lip, cleft palate, snoring, and sleep apnea. It may also be used to biopsy abnormal tissue for lab testing. Bruxism is the medical term for teeth grinding. Bruxism may be caused by stress or anxiety and often happens during sleep. Symptoms and signs include jaw pain, headache, and abnormalities in your teeth. Treatment may involve practicing stress-management techniques, cutting back on caffeine and alcohol, avoiding gum chewing, training oneself not to grind the teeth, and wearing a mouth guard.